Herbs and spices can play an optimal role in enhancing health because of their low calorie count and density in vitamins and minerals. Turmeric is an ancient Indian herb that has historically been used for its antioxidant and cleansing powers. 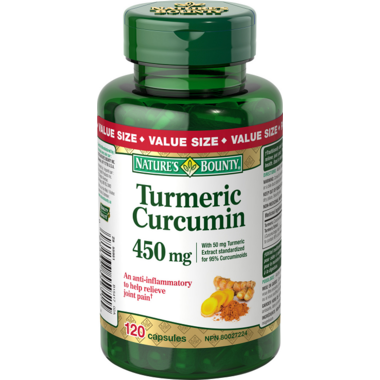 Standardized to contain 95% curcuminoids, Nature's Bounty Turmeric root is sure to give you the antioxidant boost you need to fight free radicals and maintain a healthy lifestyle. Adult Dosage (Oral): Adults, take one (1) capsule per day. Non-Medicinal Ingredients: Gelatin, Magnesium Stearate, Silica, Stearic Acid. WARNING: Consult a healthcare practitioner prior to use if you are pregnant, have gallstones or a bile duct obstruction, or if you have stomach ulcers or excess stomach acid. Been using this product, 2 capsules per day morning and evening for about a month now, and have noticed my inflammation symptoms have lessened considerable. No aftertaste, no burping. I am 62 with osteoarthritis and one knee replacement. I would recommend giving this a try. Seems to help my arthritis and doesn't leave an aftertaste like so many products. I buy this on a regular basis. I only need to take 1 a day and my neck pain is gone! After doing research, turmeric/curcumin was highly recommended in many places for my health. I will re-order it when I run low for sure. The service was excellent as always and the price was less than at our local stores. I have a rotator cuff injury and have been taking this for two weeks now as I hope to reduce the inflammation along with physiotherapy in preparation for surgery. So far my shoulder is less painful so maybe it can be attributed to this product. I've used this product regularly for a month now, and I do think it makes a difference in my pain levels. Good price at Well.ca, and always good service! Started this product to reduce inflammation in my finger joints and noticed a difference within a week of using these capsules. I take one with breakfast and one before bed. I can wear my rings again! Will keep using this product! Great sale price. Product as advertised. Great price. Using it to reduce inflammation--seems to be helping.